The Lady of the Lake’s graceful lines evoke the golden age of riverboats and lake steamers, richly appointed with handcrafted woodwork and ornate period lighting on the Main deck. She is fitted with a state-of-the-art sound system for narrated cruises and music. Public cruises are offered from Memorial Day thru the end of the season. Typically the season ends after fall color cruises, sometime in mid-October. Additional public cruises are added for Holidays and special events.Place your reservation aboard the Lady of the Lake by calling (952) 929-1209. 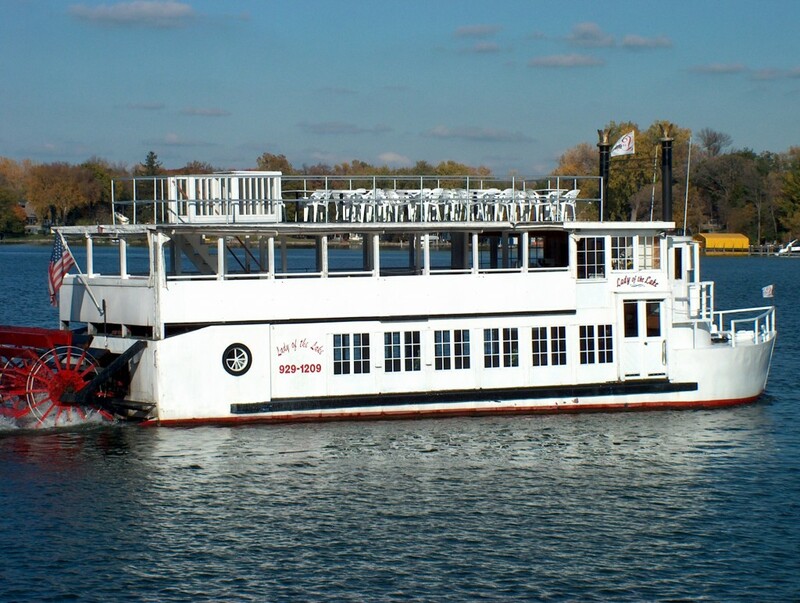 Step aboard the Lady of the Lake and enjoy Lake Minnetonka. Once travel on water was merely functional, today it offers a glamorous alternative to the ordinary. Awe inspiring views of the lake, historical settings, wildlife, and pristine flora and fauna transport you from the normal to the exquisite. Our friendly staff offer luxurious service, and offer full service from our fully stocked bar. The Lady of the Lake begins an afternoon public cruise. She departs from her port in downtown Excelsior Minnesota. The Lady of the Lake is available for private charters as well. Private charters may be scheduled by calling (952) 929-1209 and talking directly with Captain Terry Jungers. Pricing is dependent on time, day of the week, and seasonal constraints and generally falls between $200.00 and $300.00 an hour. Schedule your affair well in advance as private charter times are in high demand.